When Blessed John Henry Newman speaks of the teaching on the Virgin Mary contained in Tradition and the Magisterium he always looks to the Scriptures. There he finds the revelation of the holiness of God made to Moses, Daniel, Zacharias and others. They cannot bear the sight of God; such is his holiness. “But it was otherwise with Mary when the same St. Gabriel came to her. She was overcome indeed, and troubled at his words, because, humble as she was in her own opinion of herself, he addressed her as “Full of grace,” and “Blessed among women;” but she was able to bear the sight of him.” The Virgin Mary, although a creature, is full of Grace. This is the reason the Church calls her Mater Admirabilis. Wonderful Mother, considering your privileges we are able to admire better the holiness and beauty of your Son. Mater Admirabilis, ora pro nobis! WHEN Mary, the Virgo Prædicanda, the Virgin who is to be proclaimed aloud, is called by the title of Admirabilis, it is thereby suggested to us what the effect is of the preaching of her as Immaculate in her Conception. The Holy Church proclaims, preaches her, as conceived without original sin; and those who hear, the children of Holy Church, wonder, marvel, are astonished and overcome by the preaching. It is so great a prerogative. Even created excellence is fearful to think of when it is so high as Mary’s. As to the great Creator, when Moses desired to see His glory, He Himself says about Himself, “Thou canst not see My face, for man shall not see Me and live;” and St. Paul says, “Our God is a consuming fire.” And when St. John, holy as he was, saw only the Human Nature of our Lord, as He is in Heaven, “he fell at His feet as dead.” And so as regards the appearance of angels. The holy Daniel, when St. Gabriel appeared to him, “fainted away, and lay in a consternation, with his face close to the ground.” When this great archangel came to Zacharias, the father of St. John the Baptist, he too was troubled, and fear fell upon him.” But it was otherwise with Mary when the same St. Gabriel came to her. She was overcome indeed, and troubled at his words, because, humble as she was in her own opinion of herself, he addressed her as “Full of grace,” and “Blessed among women;” but she was able to bear the sight of him. Hence we learn two things: first, how great a holiness was Mary’s, seeing she could endure the presence of an angel, whose brightness smote the holy prophet Daniel even to fainting and almost to death; and secondly, since she is so much holier than that angel, and we so much less holy than Daniel, what great reason we have to call her the Virgo Admirabilis, the Wonderful, the Awful Virgin, when we think of her ineffable purity! 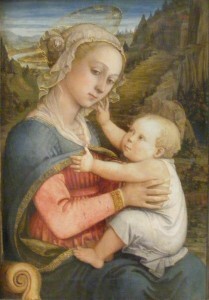 There are those who are so thoughtless, so blind, so grovelling as to think that Mary is not as much shocked at wilful sin as her Divine Son is, and that we can make her our friend and advocate, though we go to her without contrition at heart, without even the wish for true repentance and resolution to amend. As if Mary could hate sin less, and love sinners more, than our Lord does! No: she feels a sympathy for those only who wish to leave their sins; else, how should she be without sin herself? No: if even to the best of us she is, in the words of Scripture, “fair as the moon, bright as the sun, and terrible as an army set in array,” what is she to the impenitent sinner?